Qualification: Graduate with B.Ed. and working knowledge of MS Office. Experience: Minimum Three years in teaching out of which at least one year as Principal/ Vice Principal, Fluency in English and Hindi is compulsory. Age Limit: Max 50 years. Tenure of Contact: 24 Months. 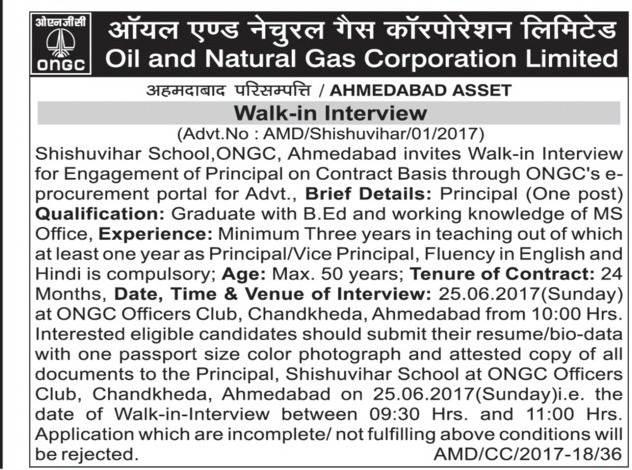 Venue: Principal, Shishuvihar School, ONGC officers club, Chandkheda, Ahmedabad. Walk-in-Interview: 25-06-2017 (Sunday) between 09:30 Hrs. and 11:00 Hrs.